It’s October and the temperature is getting colder, pumpkins and scarecrows are in display at the store, the leaves are changing colors… this only means one thing… it’s officially fall! That means pumpkin everything for me. I love when the seasons change, it is such a great reminder of how powerful and great God is that He decided to make seasons! 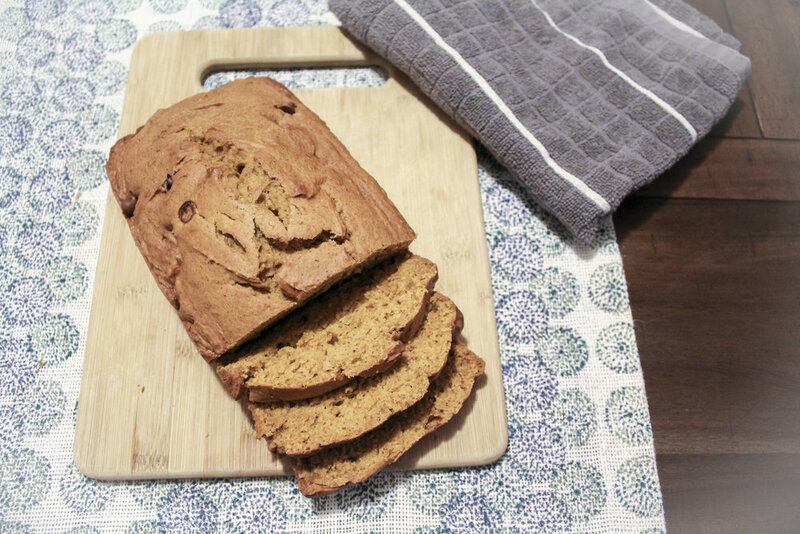 To celebrate the temperature getting cooler, I couldn’t help but to make pumpkin bread right away. Box mixes aren’t bad at all, but this time I decided to learn how to make it from scratch. I’ve whipped up this incredible recipe that makes 2 loaves and I hope you enjoy it as much as my family and friends did! Before you see the ingredients list, don’t think this takes a lot of work. It’s not. It’s just a lot of simple ingredients put together. If you’re a visual person like me, I’ve included pictures along with the instructions. If you want to jump right into the instructions just scroll down. You can also print the recipe too. Bake Time: 50 – 65 Min. In a separate bowl, whisk the flour, salt, baking soda, baking powder, ground cloves, cinnamon, nutmeg, and vanilla extract. Set aside when done. In a large bowl, with an electric mixer, beat the butter and sugar. Add the eggs. Beat again for a few minutes until it gets really light and fluffy. Add the pumpkin into the large bowl. The mixture is going to look rough. Add the flour mixture now and mix on a low speed until the ingredients are well combined. Divide the batter evenly into the two pans and bake for 50-60 minutes. To make sure the loaves are baked well, insert a knife into the middle of a loaf and take it out of the oven until it the knife comes out clean. MAKE SURE TO CHECK THEM BOTH. For some reason when I put two loaves in the oven, they never bake at the same time. One always takes longer than the other. So make sure after the time is up check both and take out the one that is ready. Let them cool before you wrap them up.